Searching for a hotel, reading numerous reviews, checking the location, facilities and price can almost become a full time job and extremely time consuming. I should know I spend many hours a week doing just that. Even when I am away on a trip I pop into hotels that look nice from the outside to get the business card/ brochure and have a quick look around the lobby,even maybe a peep into the bar or dining room. First impressions do count in my book and if the place looks really nice, with a great view or roaring log fire I will return for an evening drink or dinner. This is a great way to find new places to stay without resorting to a long Internet search and reading reviews that may not always be true. 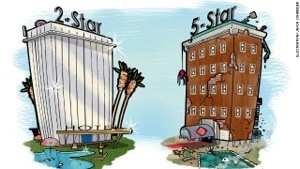 Hotel Star rating classifications change from country to country and city to city. High Star or Diamond ratings should indicate more luxury and more facilities, but this is not always the case. I have fallen foul of relying on the “5***** costs $$$$$” only to be disappointed, and in some instances I have even checked out of the hotel. A few reasons for me to take such drastic action has been, uncleanliness, broken aircon, sagging mattress, paper thin walls,dark,damp and moldy. Italy is one of my favorite destinations and I know I need to be careful of where I stay if I want to have a great sleep. All that is needed in Italy for a hotel to have a high star rating is a 24hr reception desk and a receptionist that can speak 3 languages. Last week I checked out of a hotel in Venice at 6 am, the 24 hrs receptionist was there,,,,sleeping in the hallway right outside the elevator! I almost stepped on him. In hindsight I think he may have been there to stop any guests trying to leave early without paying. Still this was highly unusual. Location, cleanliness, staff helpfulness, facilities, bedroom size, bed comfort, quality of bedding/pillows/towels, shower/bathroom cleanliness, furnishings, pool size,comfortable sun loungers, breakfast offered, free Wi-Fi, surroundings. 5***** Just as advertised on the website, will return, will recommend, loved everything. 4**** as advertised, will return,will recommend, very happy with stay. 3*** comfortable, adequate for a few nights stay, may recommend. 2** Adequate for a night or two, would not return or recommend. 1* Below standard, not as advertised,disappointed, will not return or recommend. I have kept a list of the hotels I have stayed at in the last 5 yrs. up to the end of 2012 and what a great year of travel I had and I stayed in some fantastic locations and super hotels. I am really looking forward to adding to this list for 2013, my New Years resolution is to travel more and stay at great hotels around the world! My first trip in 2013 was to Chiang Mai in Thailand.